Turn this lamp into a work of art! If you are interested in DIY projects and you have a lamp or two in your home that are just underwhelming this is the perfect project for you. Creating a gold leaf lampshade is a simple project with 5 easy to follow steps. We will walk you through it ensure that your lamp will turn out amazing in the end and you will be the envy of all of your friends at your next get together. We recommend doing this project in an area where the wind will not be able to blow around the gold sheaths. 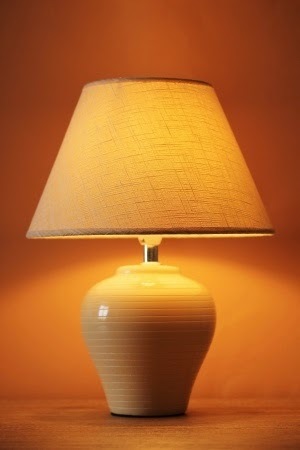 Step 1: Apply the First Coat of Paint – If you have a metal lampshade it often comes pre painted. If your shade is unpainted, apply a coat of cream colored latex spray paint and let it dry before moving onto the next step. Step 2: Wrap the Lampshade in Painters Tape – We recommend using ½ inch painters tape around the lampshade in a horizontal striped pattern. Be sure to press the edges of the tape firmly to the shade. Step 3: Apply Adhesive and Gold Leaf – Using a 1 inch brush apply a layer of the gold leaf adhesive to the non-taped portions of the shade. Let the adhesive dry for at least 5 minutes, or until the paint is tacky when you touch it. Then begin to position the gold leafs onto the sticky areas of the shade. Tap the leaves into place with a soft bristled brush and allow to dry for roughly 10 minutes. Step 4: Removing the Tape – Begin to peel the tape from around the shade in strips. If there is any adhesive remaining on the shade remove it with a cotton swab dipped in mineral spirits and wipe clean with a cloth. Step 5: Apply the Stain – Using a 2 inch brush to apply fruit wood stain to the entire shade. We suggest Benjamin Moore stain to achieve the proper look and feel. Before the stain dries, you should crumple a few paper towels and dab the lampshade. This process is called ragging off and will add the rich look to the surface that you are trying to achieve.